My nephew is basically a child prodigy when it comes to tools. And not the 'Oh! How cute! He is holding a hammer the right way' type. It is more the 'Quick! He is disassembling the baby gate' type. With two mechanical engineers for parents no one is completely surprised. Despite living a 4 hour plane flight away, it has worked out that I could be there for all of his birthdays (all 2 of them). My sister-in-law figured out a long time ago that I get unusually excited about parties and was gracious enough to let me help with the planning and baking. Also, I could definitely get used to throwing parties with someone else's money. My nephew's first birthday was an adorable Nemo party - check out the smash cake and sugar cookies here. 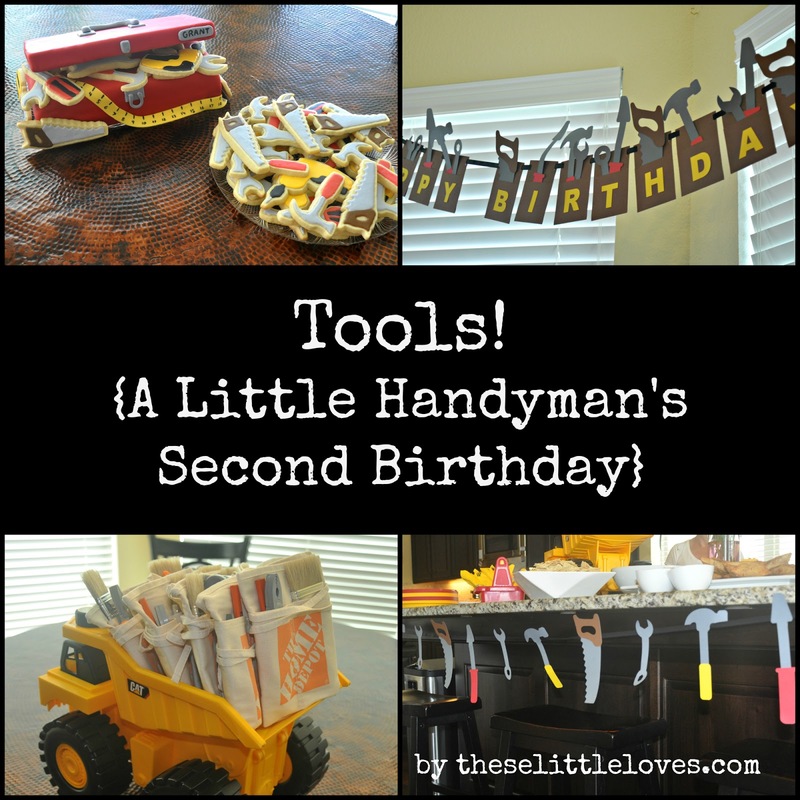 When his second birthday rolled around this summer, his party theme was obvious: Tools! 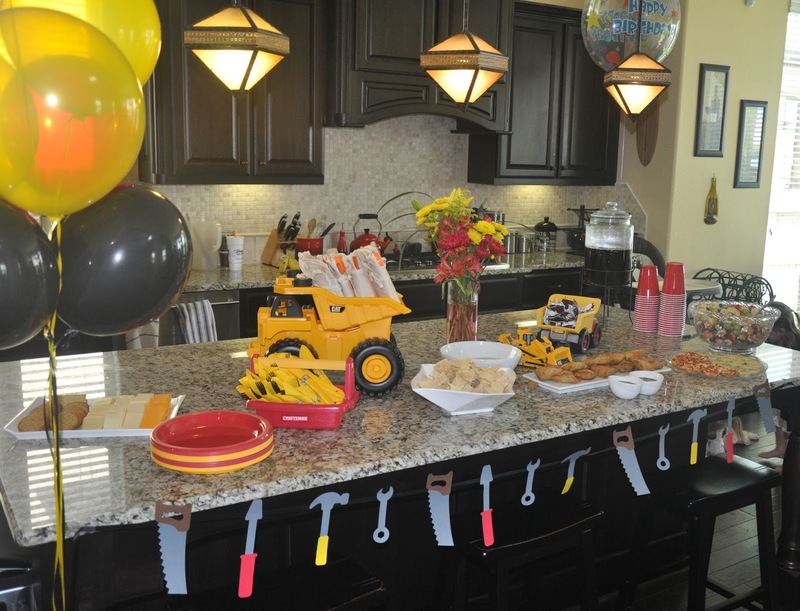 Hands down my favorite part about this party was the toolbox birthday cake and tool cookies. Oh or maybe the party favors. Hmmm. Well, we'll start with the cake. You have no idea how close this cake was to being a 'Pinterest fail'. I stretched my very modest skills with this one. Thankfully, with a few carefully placed cookies and a bit of styrofoam, I pulled it off. I considered it a success when people walked by without realizing it was the cake. In case you are wondering, the lid of the cake is fondant-covered styrofoam attached at an angle to the cake base with bamboo skewers. I'm sure there is a more 'professional' way to do that, but my MacGyver'd version worked great. 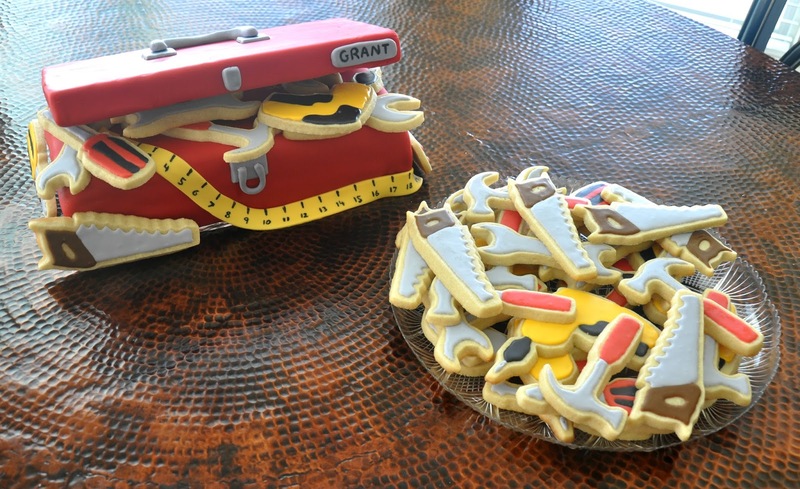 The tools are my go-to sugar cookies decorated in a glaze icing. The balloons, plates, cups and forks were all kept in the red/black/yellow color scheme. We had a little fun with the food service and borrowed some of my nephew's toys. 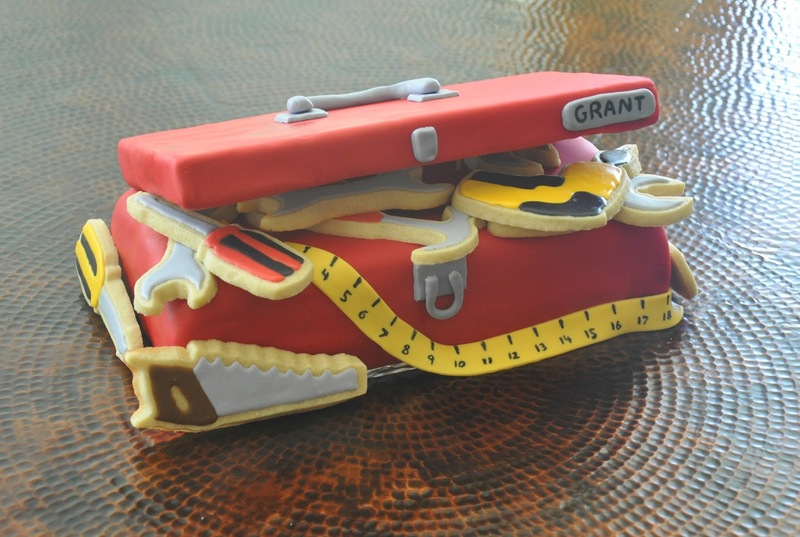 The utensils were wrapped in napkins, sealed with 'tape measure' washi tape, and set inside a toy toolbox. Toy dump trucks held the party favors and a few packaged sweets. The party favors were a big hit with the kiddos. We had a lot of fun putting together these little tool belt goodie bags. The tool belts themselves are less than a dollar each at Home Depot and perfect for little people. We found the plastic tools at Toys R Us and my brother added the tiny tape measures, paint brushes, and carpenter's pencils after a trip to Home Depot. 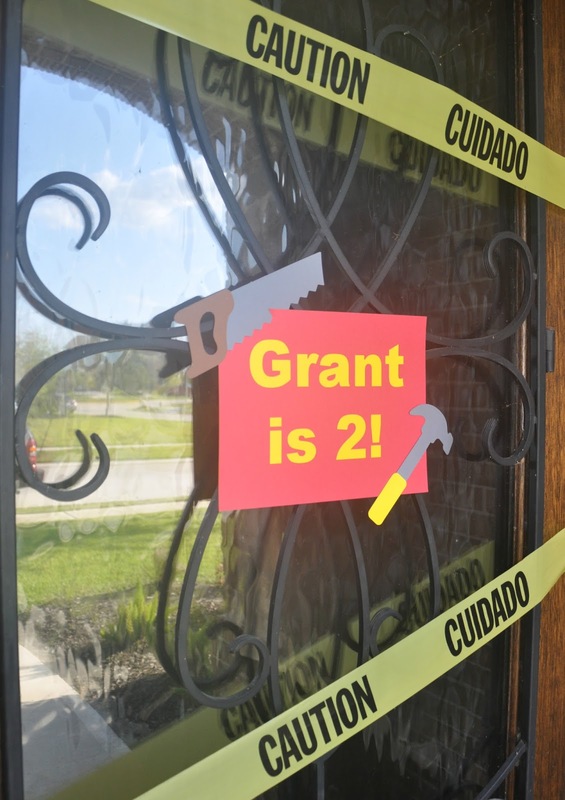 And finally, I'll leave you with what turned out to be an unintentional yet incredibly appropriate front door decoration. Speaking from experience, 2 year olds should always be approached with caution. Thanks Em! It was a definitely a fun theme :). Hi! It's Jennifer. What a cute party! I love how the tool belts fit perfectly into that handsome tractor you had. =) Very cute idea, and perfect execution. 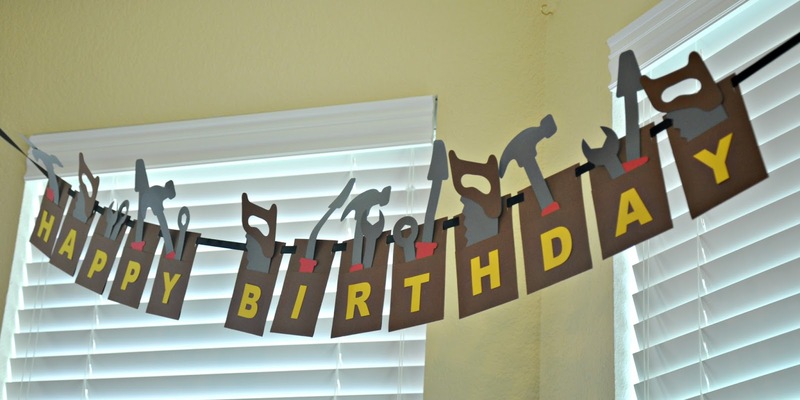 The tool belt banner was so clever. Thanks Jennifer! I think of you every time I see CAT stuff :). I do not currently sell this banner. Thanks for your interest!